The modules of the IMSP series are connected before the interface devices and provide reliable protection against voltage surges. The only 6.2 mm wide DIN rail devices are IP20 rated and can be used in the Ex and non-Ex area. 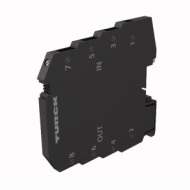 Among other things, modules are available for surge-protected connection of analog signals (e.g. for analog signal isolators and temperature measuring amplifiers) as well as for connecting binary signals from switches or inductive and capacitive sensors.